"I see no reason to let this get bogged down; there are no precedents or rules that cover this situation, so I think we may as well begin directly.... Proposals for new rules are invited. In accordance with the rules, these will be published, numbered and distributed by me at my earliest convenience." Therefore, it is my pleasure, in honor of the fourth anniversary of our great nomic, to present the horoscope of Agora, as born at the location of the nomic mailing list at Monash University, Melbourne, at the time of the First Speaker's message. Verily, the horoscope is a beautiful sight, and verily, it contains hidden within it many mysteries about Agora's past and future. Still, the interpretation of a horoscope is an art, and not for everyone to have mastered. It is therefore fortunate that the creator of the excellent program Astrolog has seen fit to include a feature that produces interpretations for those of us who are not skilled in this art. 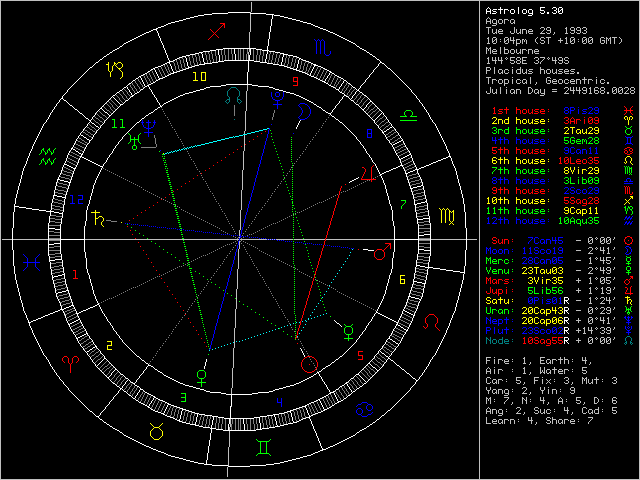 However, these interpretations still do not approach the clarity and unambiguity (cough) of a professional astrologer. Still, those who wish to ponder over their meaning, guide your Pteranodon here for the interpretations.